Poker players are notorious for using sunglasses inside buildings at the poker tables. But Greg Raymer uses the coolest sunglasses of orange color. We find his sunglasses so cool that we have put them in our logo. Greg has made himself and his sunglasses famous when he won the $10,000 WSOP No-Limit Holdem Main Event in 2004. Greg got his nickname fossilman from his habit of collecting fossils, and his orange holographic reptile-eye glasses surely helped too. Greg Raymer was born in Minot, but his family moved to Clearwater, Florida and later to Saint Louis, Missouri during his childhood. After graduating from Saint Louis's Parkway South High School, Raymer enrolled at the University of Missouri���Rolla, joining the Kappa Sigma fraternity and majoring in chemistry. In 1992, Greg Raymer graduated from the University of Minnesota Law School and became a patent attorney for over a decade. However, this was is previous life. Greg's passion for poker started while at college where he played for dimes and nickels. Over the years, his skills kept on improving and he started playing higher and higher stakes. In 2004, Greg Raymer won a $160 WSOP Main Event satellite at PokerStars. Like Chris Moneymaker the prior year, downloading pokerstars turned out to be a life-changing event for Greg. 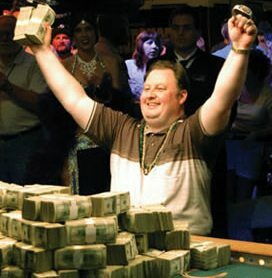 Greg won the 2004 $10,000 WSOP No-Limit Texas Hold'em Poker Main Event, pocketing the amazing $5 million first prize for his victory, defeating David Williams who had to content himself with the $3.5 million runner up prize. No one will blame Raymer for giving up his law career and he is now a full time poker professional, or part time we should say as he likes to enjoy time with his family and does not participate in many international high stake poker tournaments. Greg Raymer has continued to demonstrate his talent as a poker player. He has a total of 13 money finishes at the WSOP and 2 at the WPT. In 2005, he finished 25th at the WSOP Main Event from a field of 5,619. Coming so close to the final table after winning the main event the previous year is considered by many tournament specialists as an incredible poker achievement. Nowadays, Greg is a Team PokerStars member, meaning that he is a poker pro representing pokerstars. You can even get a chance to play him heads-up if you win one at the VIP special promotions at pokerstars. Greg Raymer is a very unpretentious and friendly character who appears on occasion on the TV. He has also been quite successful in online poker as well. He won the 2007 $320 WCOOP (World Championship of online poker sponsored by pokerstars), winning $168k. And Raymer finished second at the first quarterly $1 million guaranteed tournament at pokerstars, winning $180k and defeating a field of 1,500 poker players. If you want the chance to play poker against Raymer, it���s a good idea to sign up for a Poker Stars bonus and try to find him at the site. ���The Fossilman��� regularly plays both tournaments and cash games at Stars.